Add a touch of Minecraft and a dash of Terraria what would you get? 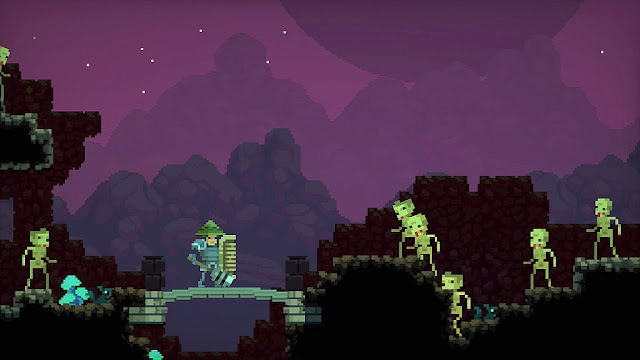 Probably this rather fine game that's doing well on Steam so far, 'MoonQuest 'by Wizard Mode. A procedurally-generated adventure game where each play through gives you a new world to explore. Filled with themed worlds, the harvest of resources, treasure and deadly creatures to fight with the possibility of a powerful weapon at hand! In development for a mind blowing 6 years, Moonquest is the latest game that's going through an early access stage that is fully playable from start to end. The game has lots of playable characters, hundreds of items, a range of environments, and many different creatures and resources. It will pull you in as you delve into spider caves, fight through the castle of the Silver King, search for gold ore, and craft mighty tools!